There was an impressive array of paved bike paths in Tulsa, OK that I took advantage of in-between the Ruts ‘N Guts and Resolution ‘Cross Cup weekends. I eagerly got my Ruts ‘N Guts report finished for Panda’s POV and recorded an interview for Crosshairs Radio. I’ll never forget the outpouring of support and congratulations I received after my Tulsa wins. It was more fuel for the fire as I focused my attention on the upcoming races in Dallas, TX. Everyone had an eye on the weather forecast. Possible thunderstorms. Guaranteed rain. Guaranteed mud. 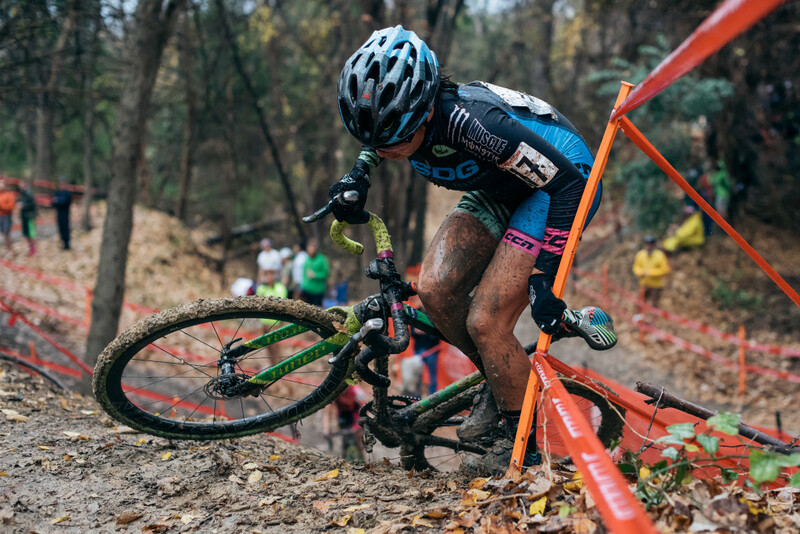 Sure enough, the heavens opened up exactly an hour before the UCI Women’s race and confirmed the decision to run mud tires. I got warmed up on the trainer and then practiced a few bike-exchanges with David knowing the B-bike was going to get some love this time around. Down at the line I got called up to the front row and focused on having a good start. Emily Kachorek (Squid Bikes) was on my left and Beth Ann Orton (Kona) was on my right. We shot off the line and I was in a decent position up the long pavement start. 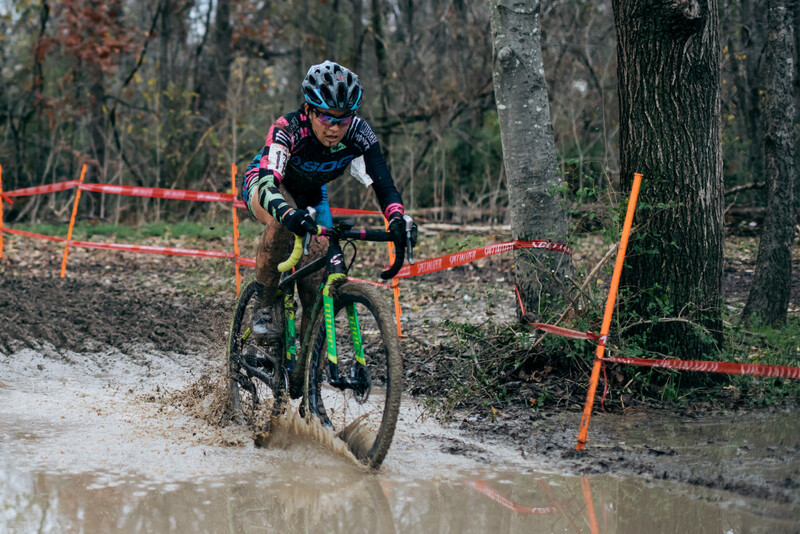 Courtenay McFadden (American Classics / Zones) had her usual amazing start and as soon as we hit the first sweeping mud turn I knew it was going to be an interesting race… During every pre-riding time slot earlier that day and even on Friday, the course was dry. With an hour of rain now soaked in to the course, the lines were evolving. A long, sweeping grass turn that you could bomb down earlier in the day was now a slippery, risky turn at race pace. McFadden led the charge while a handful of us scrambled behind her. Sunny Gilbert (Michelob Ultra/Big Shark) and Orton were leading the chase and I exchanged positions with Christina Gokey-Smith (Dallas Bike Works) and Rebecca Fahringer (Amy D. Racing). As we twisted and turned up and down the grass hills on the first third of the course, I was reevaluating lines and happy with my position but knew I wanted to be closer to the front before the technical forest section. Into the woods we went and I was committed to my lines on the run-ups. What a mistake that was. The rain had turned the run-ups into slippery messes and I barely got up the first one.I grabbed on to a tree root that stretched across and hoisted my way up to the course stake at the top of the ascent. I probably would’ve slid backwards if that stake hadn’t been there. Fast-forward to lap two, I made the stupid decision to go for the same line and barely made it up again. Finally on lap three, I thought to myself, “I should probably shoulder my bike and go up the cut-in stairs on the right side of this run-up.” I finally found the smart line and made my way up the dirt stairs for the last three laps. The second run-up in the woods was almost as slippery as the first. You could see the long etched-in lines of spikes and cleat marks that had clawed their way up like fingernails scraping up the side of a cliff, clinging on for dear life. Each time I ascended that run-up, my toes were digging in and I was looking for the driest footholds of dirt to step on. Needless to say, these two run-ups occupied a lot of my thoughts during the race. Little mistakes on obstacles like these can instantly negate any hard efforts exerted elsewhere on the course. I wasn’t racing smooth and the little mistakes were adding up. I maintained third position through to the final lap, but I could see Fahringer gaining ground behind me. I came by pit number two for the last time and Fahringer latched on to my wheel. I was being safe around the muddy turns in the trees and she was taking risks to close the gap to me. The course weaves around more trees before making a sharp left turn on the pavement stretch. As long as I reached the pavement first, I knew I could give it my best sprint to the line with a bike-length advantage. Fahringer is strong, there’s no doubt about that. Admittedly I was terrified she could get around me before the finish line, but I put myself into a dark corner of the pain cave to get there first. I secured third place and was elated to finish on the podium behind McFadden and Gilbert. One thing I’d like to note is that David and I have been offered more places to stay while we’ve been traveling down here than I have anywhere else in the country. The hospitality and thoughtfulness oozes from this cyclocross community. On Saturday night however, I couldn’t help but think that any host would’ve hated us as guests. David broke down bikes to dry everything out after a day of multiple power-washing cycles, I hand-washed mud out of clothes in the bathtub before taking them to the washing machine, and we hastily threw food together in our kitchenette. I’m always so grateful when people offer housing to us, but we had to respectfully decline knowing the mess we would be making. Until we have a more legitimate set-up, our dingy stays at cheap hotels with kitchenettes and laundry facilities will have to suffice. The pitter-patter of rain continued all night long and well into the morning. The course was going to be absolutely soaked from overnight rain. We set the tent up when we got to the course and it finally stopped raining around 10am just before David’s race. Side note: you can’t expect someone to coach you, build and rebuild your bikes, and travel around to races without having a little fun racing. Unlike the previous day, this race was going to require bike changes and possibly real work in the pits for me. The guys working for the Soundpony Team gave me a hand when I needed help with David’s bike catches and I got a quick schooling on the fastest way to hose off the bike with the power washers. It was nice of them to say how much respect they had for me because I was working the pit in the morning for David and then racing later. Thanks, guys. Success in this sport wouldn’t be possible without community and solid teamwork. 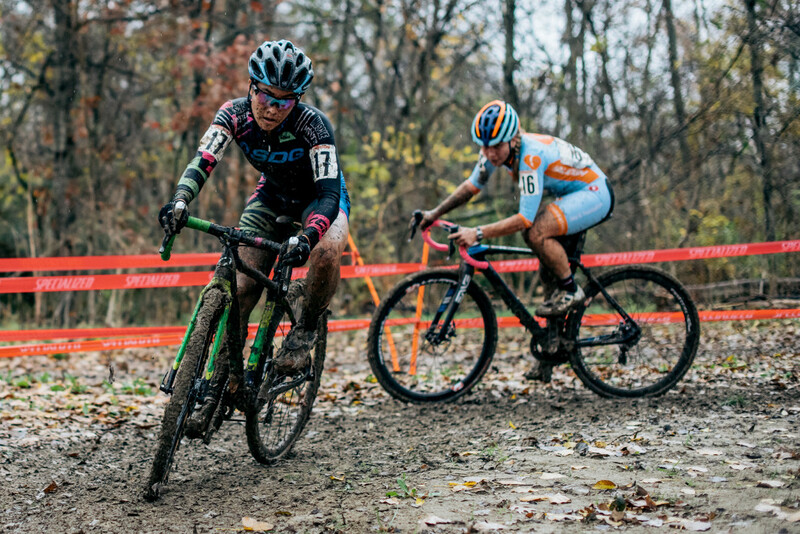 I was able to get two muddy laps in prior to getting on the trainer before my race. The mud was heavy and the course was demanding a lot of power to push through it. 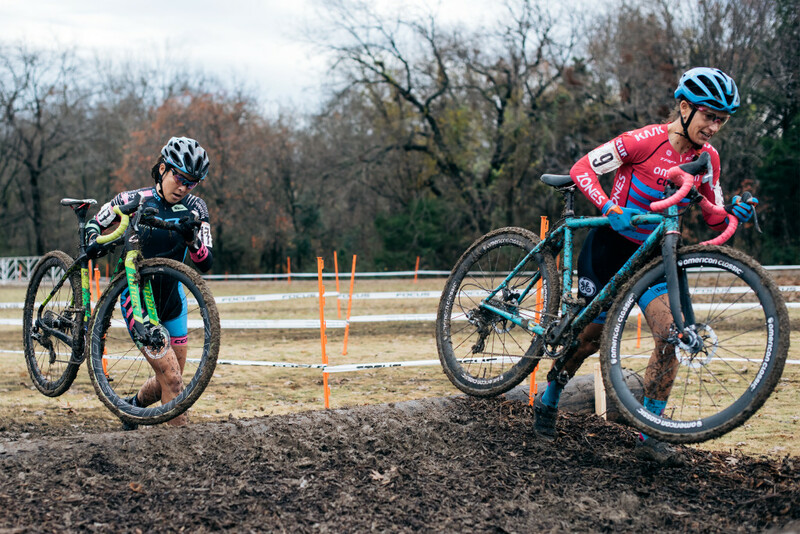 The nightmare of Nationals in Austin loomed over my head and I dreaded another muddy, disappointing race. I had the fourth call-up because Orton wasn’t feeling well and was out of the day’s race. With a minute to go all I kept telling myself was, “Get clipped in. Get clipped in. Get clipped in and go.” I knew that as long as I got in quickly, I’d be able to sprint up the long start straight and position myself well. The whistle blew. I felt the comforting snap on my left foot and went for it. Suddenly it was just me and McFadden next to each other as the field pushed up the pavement climb. When we hit the muddy grass a couple girls came around me. The course curves back up the hill and weaves through a couple sharp 180 turns. Pre-riding it earlier, I knew these turns would be slow in the mud and in the scrum of lap one it would be smarter to run depending on position. I was probably sitting fifth at this point with the first lap jostling taking place, so I made the move to jump off and run around the two turns. I found my way back on my bike in second position behind McFadden as we made our way down the slippery grass descent. I was right where I wanted to be and stayed there. I charged up the hill climb by pit number one and led into the barriers. McFadden passed me on the descent and led over the logs. I stayed behind her through the woods until pit number two. Just after the second pit exit there was a muddy line and a grass line through the next turn. 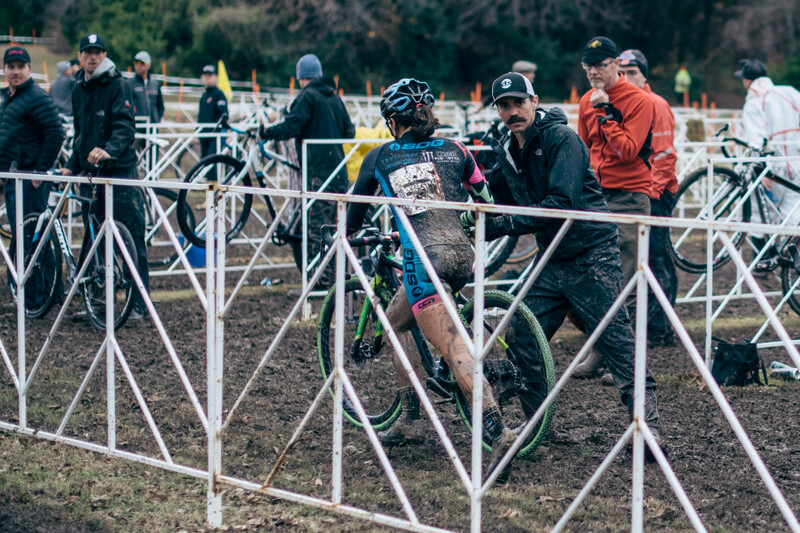 I stayed left on the grass and passed McFadden as she pedaled through the mud on the right. The giant puddles of muddy water came next and I got through the twisty section with conviction, putting me on the pavement and through lap one in first. One of the course highlights on Sunday was the waterfall climb after the start/finish. On Saturday this segment was a fun, a slight technical single-track climb. On Sunday the rain turned this into a temporary stream and it was like pedaling up a mini waterfall. It was so fun to ride up and I knew I wouldn’t lose any time on the climb. I tried to be as smooth as possible on the next two laps. For the first time ever, I was actually RACING in the mud. 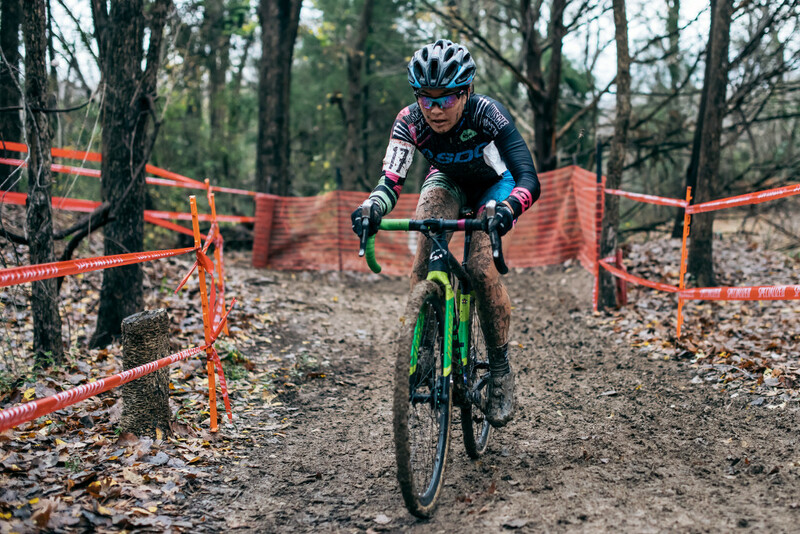 Looking back on previous muddy races, I feel like I was just riding around in the mud, feeling it out and learning how to respond to the sloppy terrain under my wheels. On Saturday I gained confidence in the partial mud and on Sunday I took calculated risks that paid off in the mucky conditions. I felt like I finally got revenge on the Texas mud that got the best of me in January earlier this year. I maintained my lead while the race for the remaining podium spots took place behind me. With two to go, Gilbert had passed McFadden and Richard Fries’ commentary was making this out to be an exceptional race. When I came under the start/finish with one lap to go, the time on the clock read exactly 39 minutes. They timed this course perfectly to force this women’s race into one of the longest possible race lengths. With Gilbert on my heels and charging, I was going to get pushed to my limit on the last lap. I knew I had to make as few mistakes as possible to win this race. The wooded section would have to be smooth and any hiccup would be throwing precious seconds out the window. I had a fifteen second gap that dwindled down to less than ten seconds by the time I came by the pit for the last time. The remaining twisty section through the trees and giant mud puddles wasn’t enough runway for Gilbert to make up any more time on me. Something that rarely happens: my last lap was my fastest lap. It was driven by pure fear, adrenaline, and excitement. I looked back one last time and sprinted down the pavement toward my third win of the season. Immediately after crossing the line I was ushered over to a nice lady named Katie who was to be my chaperone for the United State Anti-Doping Agency (USADA). She told me she was going to follow me wherever I went until I wanted to go over to the RV for paperwork and a bathroom visit. That was quite an experience. The whole ordeal took about an hour but I learned a lot. Like next time I’ll hose off and get changed before going to the RV because it’s not just going in and out of the restroom. I’ve seen plenty of BtB episodes where Powers goes through the routine after a race and although it was not conducive to proper recovery and certainly time-consuming, it felt special. It was as awkward as you can expect; but regardless I have to appreciate their efforts to keep the sport clean. Sunday night’s cleanup was even more arduous than Saturday. It was late by the time each bike was taken apart, clothes were finally drying, and dinner was made; but I had a beer and finally breathed a sigh of relief. There’s so much more work that goes into a muddy race weekend, so to add a victory on top of it all was overwhelmingly gratifying. 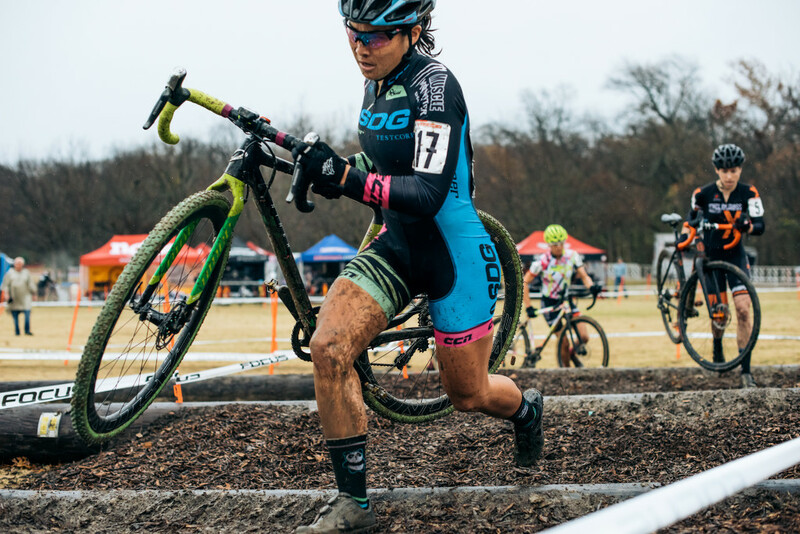 We’re on a roll with Panda’s Tour of the Southern ‘Cross Cup series. I hope the significance of this series is fully appreciated by everyone reading this. Without these promoters in Oklahoma and Texas coming together to make this mini southern series possible, I would still be ranked around 150 in the UCI rankings. The first step to improving the rankings and gaining more points is having the opportunity to do so. 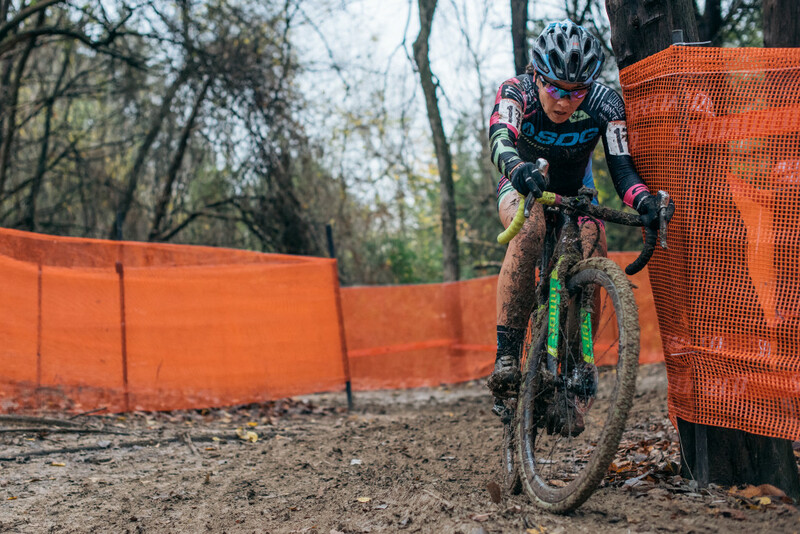 This weekend I’ll be racing in Waco, TX for the Highlander ‘Cross Cup and I couldn’t be more excited to continue racing down here! Great read Amanda, and even better racing! Sunday at Resolution CX was really exciting! Looking forward to the Waco weekend for you as well….keep it up! Thank you, Tanner! So appreciative of all the hard work to make this mini series possible!!! Liked hearing you on CX hairs with Bill, you got some talent to move up in the sport so fast. Come out to DCCX next year if you can make it(Bill should be announcing)! I will keep reading your reports.